More than other wilderness environments, the desert is commonly seen as a place for spiritual rebirth or just some contemplation. Some speculate that it’s no coincidence the world’s great monotheistic religions originated in the desert. Or perhaps it was the other way round: the Fertile Crescent along with timely wheat mutations and climatic cycles spawned great civilisations from which monotheism evolved. Anyway, just being in the desert it’s commonly thought one can be purged, cleansed and reborn. When striped of familiar surroundings and associations, you commonly hear travellers professing an awareness of their insignificance in the great scheme of things. Whatever, it’s always been seen as a good place to get away from it all, including other people. Another one of those periodic ‘I want to cross the Sahara by camel’ posts popped up on the forum the other month. The OP ‘…thought to myself ‘I want to have a life changing experience’ and thought this would be just that adventure.’ Across the width of the Sahara from Atlantic to Red Sea. There followed some clarification, good advice and some scorn, and within a few days the thread blew itself out. 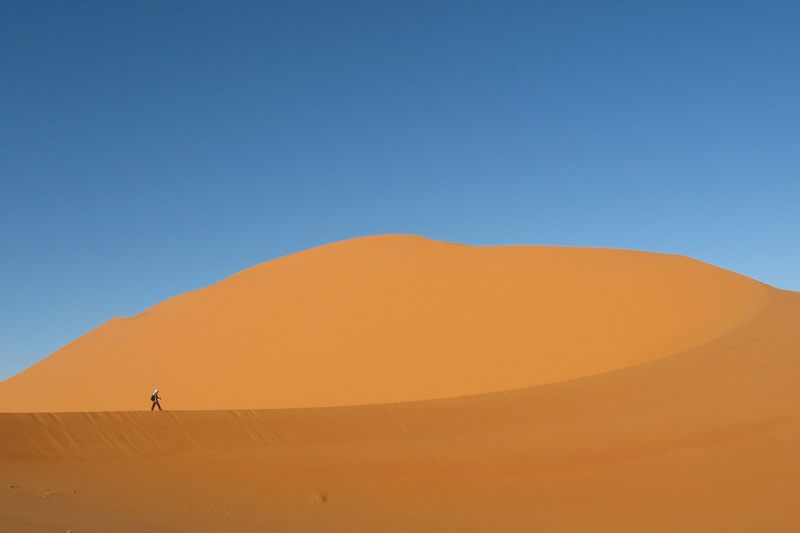 What is it about crossing the Sahara? 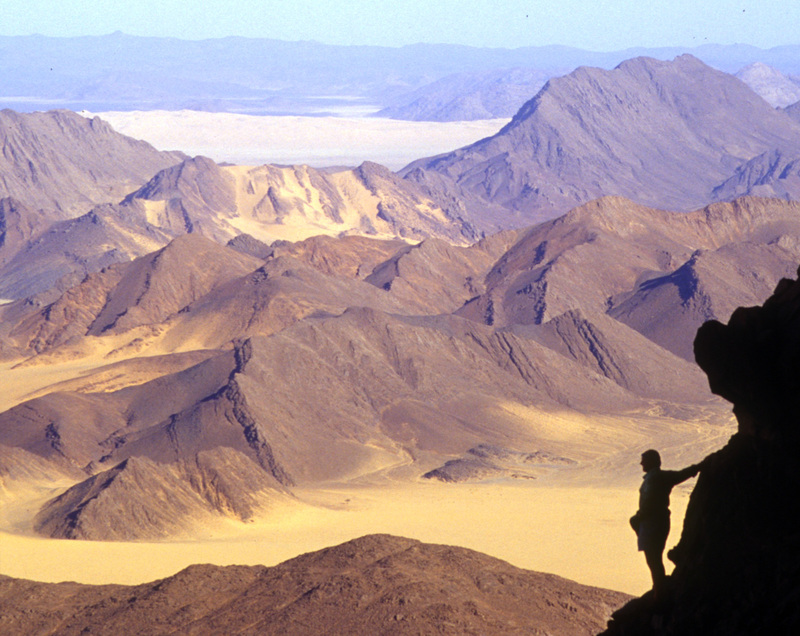 Why do ordinary individuals get fixated on the idea of ‘crossing the Sahara’ at all costs? I know when I first went there the Sahara was something that was on the way to where I thought I was going, but so was France and the Mediterranean. 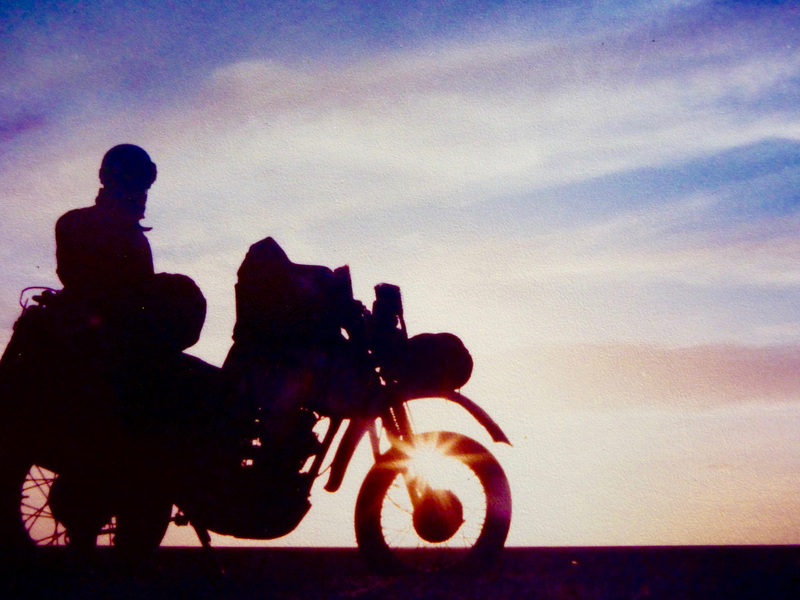 I didn’t see crossing the Sahara as a life-affirming achievement or any sort of event – I was more looking forward to the simple challenge of some desert biking. Perhaps the words ‘cross’ + ‘sahara’ add up to a compelling soundbite that anyone anywhere will get instantly, like ‘climbing Everest’ or ‘rowing the Atlantic’, but perceived as a whole lot easier. I received a similar enquiry. 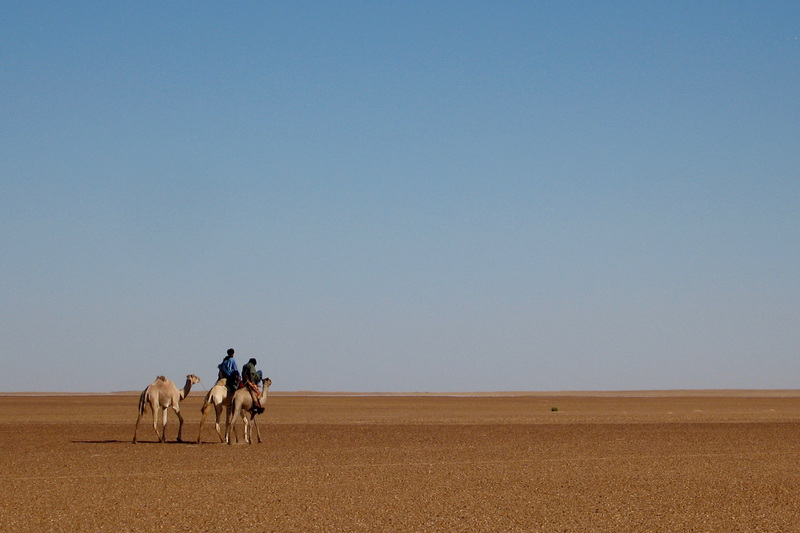 A chap wanted to cross the Sahara with camels – it didn’t really matter where, it was the crossing that mattered. He suggested some catchy start and end points like Casablanca to Dakar without really thinking it through – padding alongside Morocco’s busy N1 highway with a troop of dromedaries strung out nose to tail. I made what I thought were some better suggestions that would give a real sense of travelling in the desert with camels while dodging the worst of the current political complications. I even sent him the camel chapter from the book (short version of this). I never heard back. On the right is my answer to another enquiry which boldly stated the intention to pull off a hare-brained scheme so I’d have no doubt of the total commitment. ‘Nothing is impossible!’ Never heard from her again, either. Maybe I am too blunt but I keep these emails as evidence of ‘well, I did warn them’ should they ever crop up in the news. It seems that people hungry for adventure lose something of their reason when it comes to crossing the you-know-what. They’re carried away by the concept which ignites the dream and set about with a steely determination to make it happen. 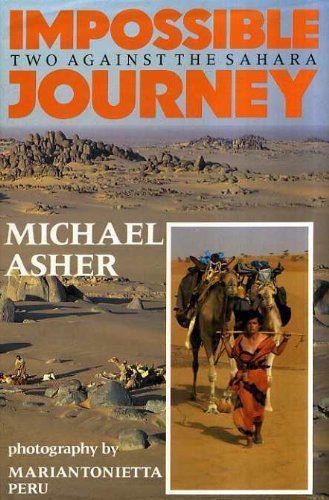 To my mind camel crossing the Sahara north to south and especially laterally requires a solid background of experience which is why I respect the achievement of Michael Asher and Mariantonietta Peru when they did it in the 80s and went on to write Impossible Journey. At least they had a good idea of what they were taking on. These days the journey is a whole lot more impossible. There must be something about camel trekking across the Sahara that makes it sound relatively uncomplicated and easily done alone. You traverse the wilderness with the unspoken companionship of your caravan and maybe a nomad guide whose language you don’t speak: ‘horses with no names’ who won’t question insecurities or flakey motivation. Aside from the practicalities or logistics of such a monumental task, what irks me is that very often there’s little curiosity about the environment or the cultures they’re passing through. 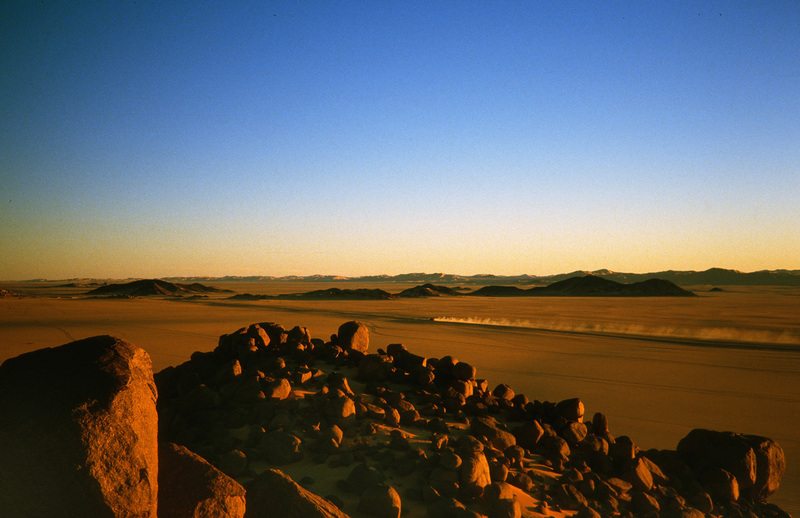 The conquest trounces all, and the empty Sahara is just a backdrop for a monumental vanity project, as it was for Geoffrey Moorhouse back in the 70s and several others before or since. As I was told recently by an individual who came close to death in his quest: It was a bad time and I made poor decisions. I desperately wanted it to be “me and the desert” and to have my own experience in solitude. I’m wiser now. Once I get used to it and feel comfortable I like to be alone out there too, and in the desert that’s not hard to do. If anything it helps you re-evaluate human companionship which may be part of the catharsis some seek out there. But I find there’s no need to go to extremes to do this. 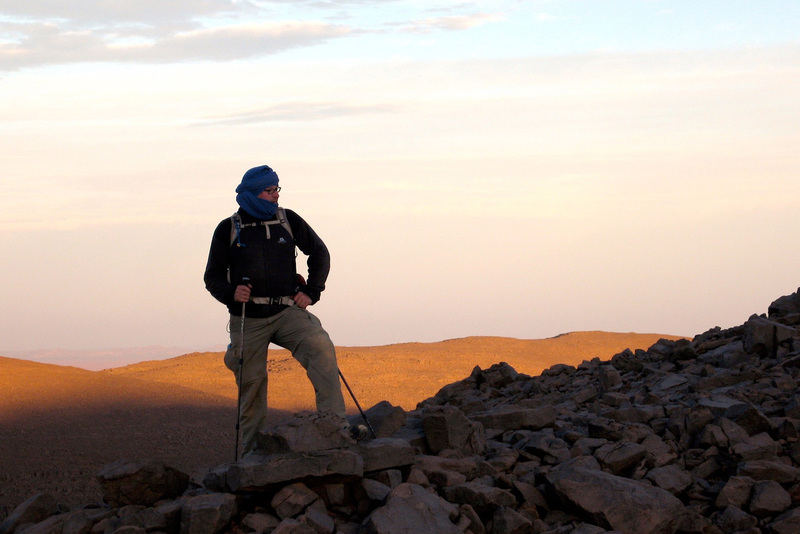 One memorable desert camp is all that’s required to consolidate a feeling of well being. For me the image below sums it up nicely. Only a mile off the track to Djanet in 1988. For the moment the bike was running well and so was I. It was nice spot for the evening – comfortably alone. There have been many more nights like that out in the Sahara, with or without other people. Usually though I’ve found travelling alone with a vehicle tends to extinguish any mystical retrospection. On a bike you’re totally preoccupied with keeping upright, not getting lost and all the rest – and in a car it’s the same plus the noise and the shaking. It is the evenings that are a blessed respite from the task, the heat and the wind and when the appeal of the desert is easily felt. In a group, walking with camels and crew is a far more satisfying way to enjoy the desert day or night, most probably because there’s so very little to worry about. You don’t have to know any more than how to walk, sleep and eat. It’s the very simplicity of such desert travels that strikes the chord, even if this is a fantasy enabled by the hired crew of desert nomads. The actual practicalities of making it happen and sustaining camelling independently get quite complex as many accounts that I’ve read have shown. And now you have to account for the unglamorous and unromantic political overlay. I suppose the hope is that when one gets to the Other Side one is reborn or cleansed or at the very least feels a sense of achievement which ought to trump all insecurities. But no account I’ve ever read has admitted to that. Or perhaps midway through the journey there is some sort of epiphany with a closure and acceptance and an understanding that life must go on, at which point the epic challenge may lose its purpose. ‘Coz the desert had turned to sea. Me, I just like being in wild places including the desert. It doesn’t have to get complicated. This entry was posted in Sahara A to Z... on December 14, 2016 by Chris S.